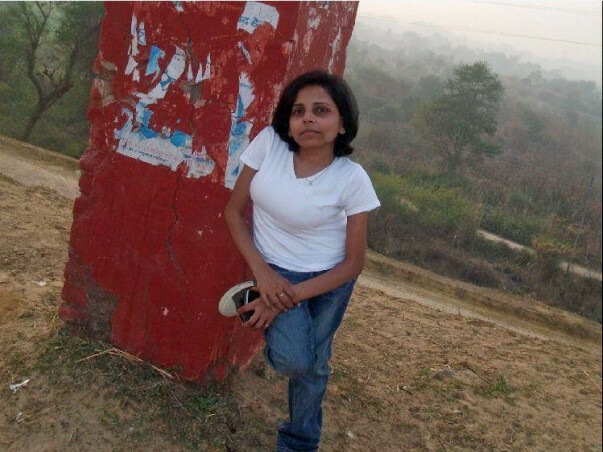 Help Reshma live and have a better life ! Reshma, was one and half years old; when a polio vaccine that she was administered, had an unforeseen reaction and she was completely paralyzed, for almost five years. Once she recovered from the paralysis, the after effects of the reaction caused her spinal cord to bend and that’s how she got hunch-backed. A condition that is called Paralytic Scoliosis. 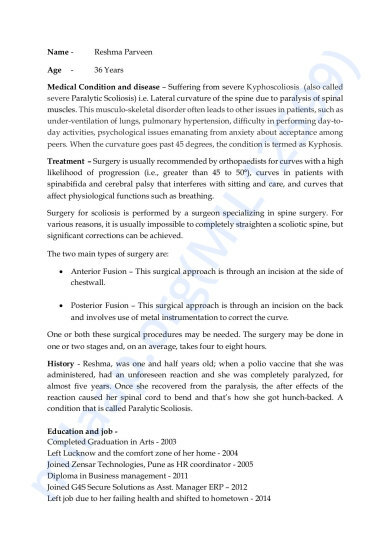 Medical Condition and disease – Suffering from severe Kyphoscoliosis (also called severe Paralytic Scoliosis) i.e. Lateral curvature of the spine due to paralysis of spinal muscles. This musculo-skeletal disorder often leads to other issues in patients, such as under-ventilation of lungs, pulmonary hypertension, difficulty in performing day-to-day activities, psychological issues emanating from anxiety about acceptance among peers. When the curvature goes past 45 degrees, the condition is termed as Kyphosis. Surgery for scoliosis is performed by a surgeon specializing in spine surgery. For various reasons, it is usually impossible to completely straighten a scoliotic spine, but significant corrections can be achieved. Present State - For the past two years, the curvature of her spine has started increasing. This has been putting excessive pressure on her internal organs, which if untreated could be life threatening. 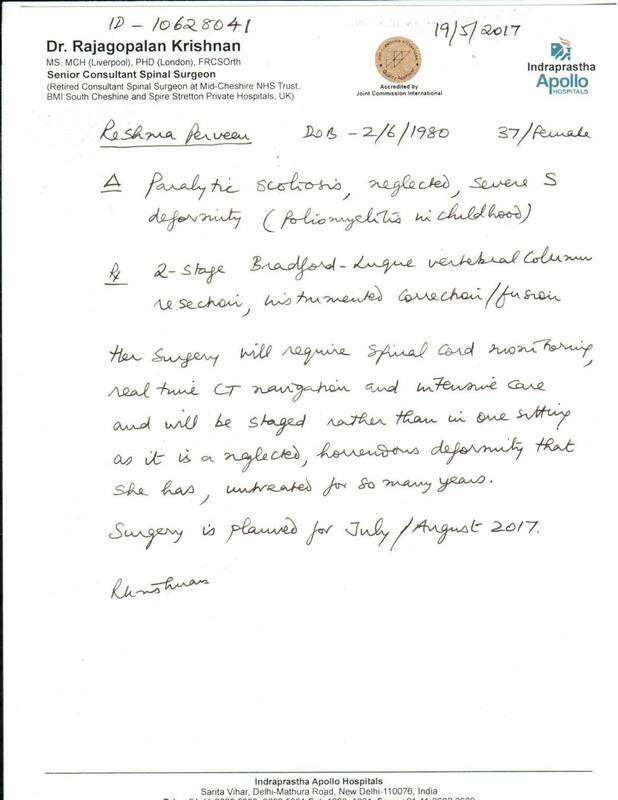 Way Ahead - Dr R Krishnan (Senior Consultant Spinal Surgeon) from Apollo Hospitals, New Delhi who has dealt with similar cases in the past has agreed to undertake the surgery. This major surgery would be undertaken in two stages, which should eventually help in straightening her spinal cord to 60 or 70 degrees. After the surgery, she would need extensive physiotherapy and full body braces for a year to give her enough strength to walk and get back to a better life. However, if the surgery doesn’t take place in the next few months the probable success rate would go down exponentially. P.S. - Her family is not in a financial condition to support the cost of the surgery and recuperation. However, she has taken a leap of faith and decided to undergo this surgery and is banking on you for your prayers, good wishes and financial support. Thank you for the support. The surgery is scheduled for the first week of April in Bangalore - Manipal hospital. 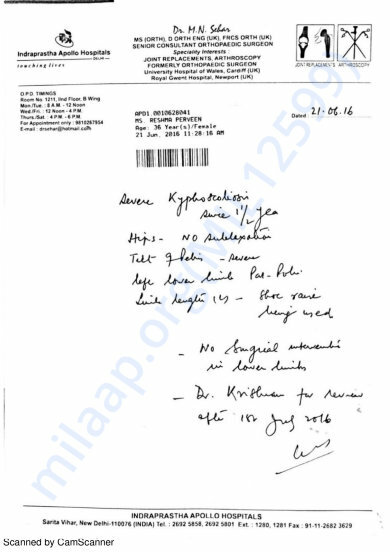 We could not proceed with the surgery in Apollo, Delhi due to unavailability of some equipment for the surgery. We waited for a long time for the availability for the same, however, it just did not work out. So we started again from the scratch with the investigation and tests and finally found Dr Vidyadhara S in at Manipal Hospital in Bangalore who decided to take up Reshma's case. Thank you for the wonderful support. Will keep you posted. Thank you for all the support. We have tentatively decided the date for surgery in July-Aug. Reshma is traveling to Delhi on the 7th of July to get the presurgery check up done and to make the payments and take the date. Reshma has now recovered from the fractures and got back on her feet. We have taken the surgery schedule from the doctor and now moving ahead with the process.